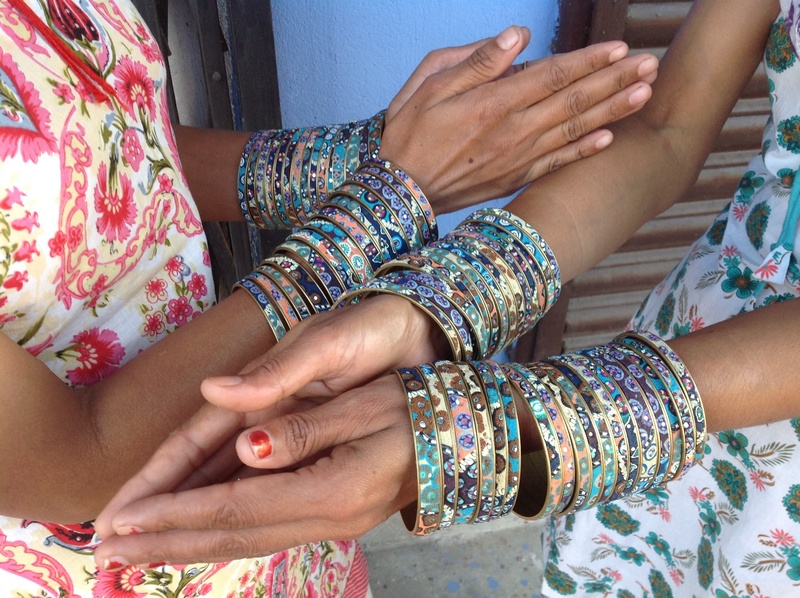 Just about to head to Janakpur with our assembled group…indeed a colourful lot. Every time I come over, I tell the ladies I could return with a short salt and pepper boy cut. Oh how they laugh. But the truth is, I could. I am sick of colouring my hair. One thing that stops me is that my dear MM, who rarely comments on these issues, once said We’ve had many changes in our life recently. Let’s leave the hair a constant for the time being. And long hair really is so much more easy for me here. There are just a few things that make me a tiny bit anxious when I stay in Nepal. One is avoiding mosquitoes, another is over spending on administration by large INGOs. And possibly the worst is colouring my own hair. I am very happy to pay a professional for this and in Australia, I do. Here, although Sita down the road offered, I am kind of used to doing it myself. It is like a little Overcome the Fear and Do it anyway challenge. Here are some lessons learnt from doing my own hair colour in Nepal. Sita, in the shop next to Ratan’s Handsome Parlour, sells little colour application brushes for 15/- (15c) should you discover you left everything but the colour itself at home. Xandu Balm, a liniment, is a reasonably effective barrier cream to apply to the hairline but does leave the hairline a bit red and tingly. Any left over hair colour will be used happily by other family members, male and female, happy to have a crack at home colouring and obviously less anxious about the whole process than me. It is much, much, much more fun using warm water for the process. I imagine. We only have the cold kind here. People often have henna all over their hands so if you have forgotten your plastic gloves (Sita didn’t stock them) your hands don’t look so terrible really. Hair mascara lasts pretty well between colourings but attempting to cover more than several cms of skunk stripe is probably a bit ambitious. Go down to Sita and buy the bloody brush. 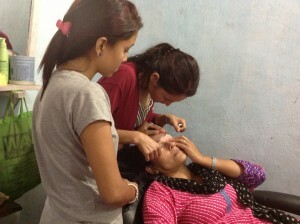 No photos of the colour but here is eyebrow threading close up! Sita is my eyebrow organisation queen! 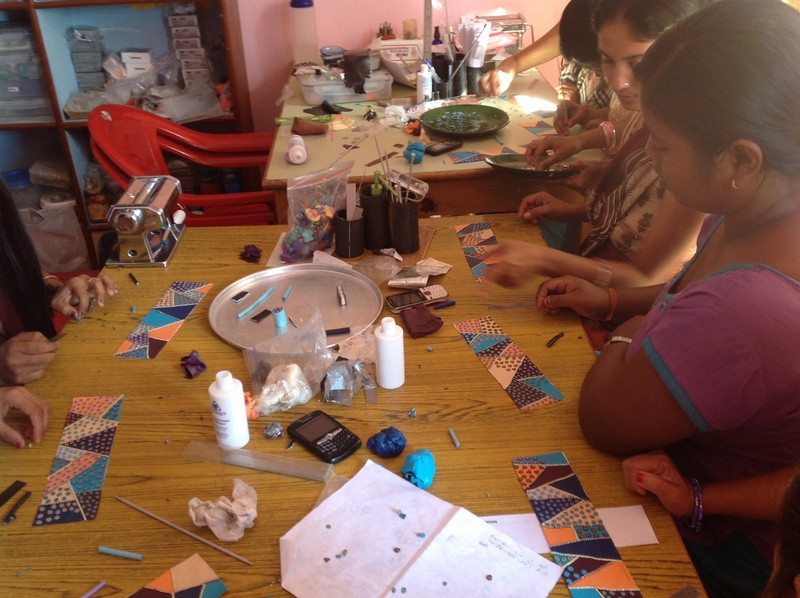 And now, get over to this Colourful Journey post to learn about our Raising the Roofcampaign! This entry was posted in Uncategorized on November 22, 2013 by wendy.